Dr. Todd Allen is currently a Professor at the University of Wisconsin and a Senior Fellow at Third Way, a DC base Think Tank, supporting their Clean Energy Portfolio. He was the Deputy Director for Science and Technology at the Idaho National Laboratory from January 2013 through January 2016. Prior to INL he was a Professor in the Engineering Physics Department at the University of Wisconsin, a position held from September 2003 through December 2012. 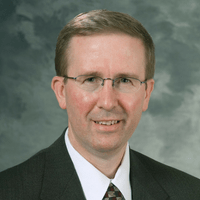 From March 2008-December 2012, he was concurrently the Scientific Director of the Advanced Test Reactor National Scientific User Facility at INL. Prior to joining the University of Wisconsin, he was a Nuclear Engineer at Argonne National Laboratory-West in Idaho Falls. His Doctoral Degree is in Nuclear Engineering from the University of Michigan (1997) and his Bachelor’s Degree in Nuclear Engineering is from Northwestern University (1984). Prior to graduate work, he was an officer in the United States Navy Nuclear Power Program.